If you ever took a prep course for the ACT or SAT, you heard this piece of solid advice: If a question stumps you move on to the next. Come back to it later, if you can. Move on doesn't mean abandon. Which is why, when I read Mark Brown's tribute to John Conroy in the Wednesday Sun-Times, I didn't think twice about this passage: "His editor suggested he move on to the next subject, and he tried. After all, he told himself, he wasn't having much impact. But he kept coming back." But anything that can be taken the wrong way will. Steve Rhodes, writing Thursday in his Beachwood Reporter, said, "Even the lone reporter [Conroy] whose heroic reporting was long ignored by the mainstream media despite its obvious and amazing thoroughness had to swim upstream in his own shop." That's not true. The subject of Conroy's heroic reporting was Jon Burge and police torture, of course, and the Reader welcomed and proudly published his stories on the subject from 1990 to 2007. That's when Conroy, whom Rhodes aptly calls "a journalist more deserving than anyone in this city of a Pulitzer Prize," was laid off, again in Rhodes's words, "so the Reader could take his surprisingly paltry salary off the books." Unfortunately, paltry money is the coin of the realm around this place, whose owners recently filed for bankruptcy. Needless to say, since Burge was arrested we have wished Conroy were still writing for us. But that's something we've wished since he left. Having had my say, I recommend both pieces I just mentioned. Brown is characteristically gracious and Rhodes is characteristically in a snit. 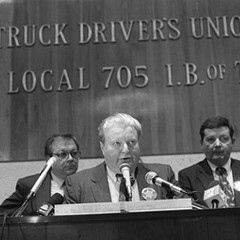 He alertly compares the mayor's inane sputterings on Burge quoted in the local press to his articulate and reflective statement in the New York Times. Which shows what a $4.7 million PR operation is good for.